Keeping spyware at bay doesn't have to be complicated. With 1-2-3 Spyware it is demonstrated that with a friendly interface and the minimum amount of options, anyone can protect against spyware without any major problem. 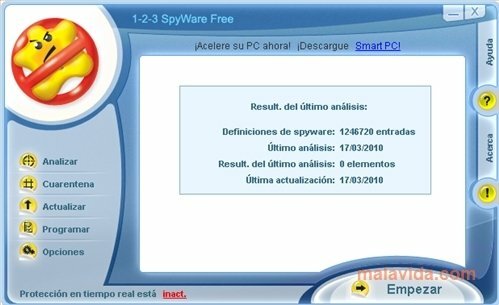 1-2-3 Spyware isn't missing anything, it has all that is necessary to be a good antispyware application: a quarantine zone for suspicious files, an enormous database, nearly daily automatic updates, real-time protections and a series of other features that make it one of the best applications in its category. The real-time protection works against spyware and adware, in such a way that no software that is slightly suspicious of being malware of this type will be capable of entering your system without you knowing, because 1-2-3 Spyware will detect it. 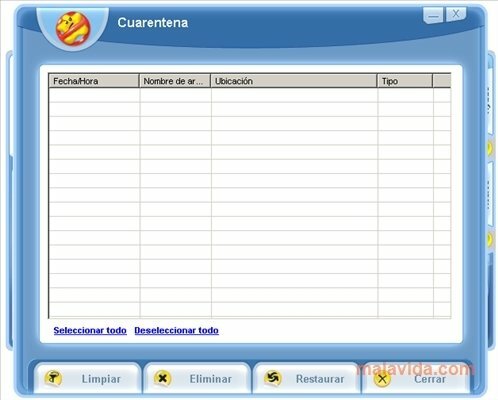 What's more, during the system analysis, it will also provide the user with information about the Windows Registry file, so that the user solves the problems that may arise with specialized software. Thus, you know, if you want an antispyware application that is simple, easy-to-use and that has a very comprehensive interface, don't think twice, download 1-2-3 Spyware.